In busy work environments that require high quality results from every wash,our Gompels Premium Fabric Conditioner boasts a unique patented antimicrobial action that effectively prevents against future microbial or fungal build up. This technology reduces the appearance of bacterial contamination while working effectively at low temperatures making it an ideal choice for budget saving washes. Not affects by the rinse cycle, it continues working long after drying or wear ensuring your clothes stay fresh for as long as possible with an antibacterial finish that lasts up to 2 months. 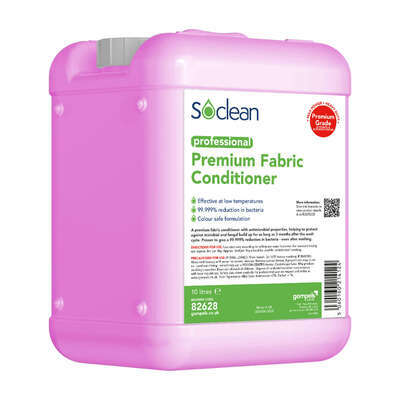 In addition to the benefits for your clothes, the fabric conditioner technology builds up over time within your washing machine to help reduce the number of fungal spore sites and therefore helping to extend the life span of your unit. Encapsulated fragrance technology ensures the scent only breaks down in a tumble dryer or when ironed which, in turn, helps to prolong the smell for as long as possible. Here at Gompels, we stock a wide range of washing equipment from the Addis Laundry Basket 40 ltrs to our Laundry Bags 30" x 33" and additional chemicals like our Gompels Heavy Duty Low Temp Stain Remover.